We went for our 28 week ultrasound yesterday. Madison is doing great! She now weighs 2 pounds and 11 ounces. 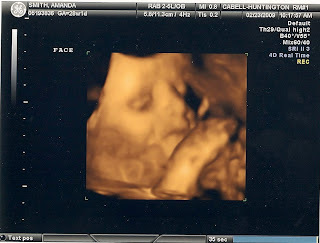 The ultrasound tech didn't think we'd be able to do the 3d this time because a certain baby girl wasn't the most cooperative. I'm really beginning to think she doesn't like having her picture taken. She gets that from her daddy! 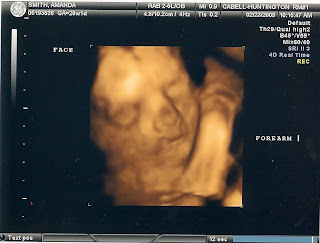 She finally gave us a few decent 3d shots...although in every one of them you can see the placenta. haha. She stayed right up against it and had her face pressed into it. She started moving around a bit and tears of joy just started streaming down my face. We love our baby girl! She kept sucking on her hand! It was so adorable to see her little mouth moving. I have to make sure that I balance each carb intake during the day with protein. Looks like I'm going to be eating lots of cheese! We are almost finished with Madison's room...just need to finish decorating the walls! I have gestational diabetes. I'm not sure exactly what that means for Baby Madison and me yet. The doctor said that basically she is producing a hormone that is keeping me from producing insulin. I do know that the doctor wants to attempt to control the problem with diet first. I'm supposed to be meeting with a dietitian some time in the next 2 weeks to discuss my new diet. Each day, I will have to test my blood sugar first thing in the morning and then 2 hours after every meal. I'm supposed to keep a log of the measurements and bring them with me to every appointment. I'm wondering how strict this diet is going to be...I'm definitely willing to do it, but it does make me a little nervous. I hate protein. I don't eat a lot of meat. Most of my energy comes from carbs, and I'm wondering how many I will be allowed to have. I'm also a little concerned that I may start losing weight. Madison's heartbeat is still really strong and she seems to be doing well. She is super active! We have an ultrasound a week from today. I'm very excited for this one because the tech said at the last appointment that we'd try 3D. I'm hoping that she cooperates, and I get to see her little face. 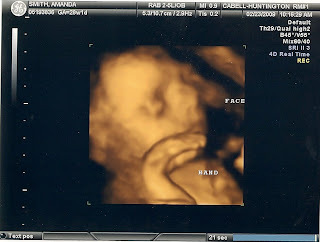 I'm totally amazed by 3D ultrasounds! I can't believe that in a week we might have a better idea of what she looks like! My due date is 3 months from today! I constantly wonder when she'll actually be here! We are so anxious!!! Just got a call. I'm going to a nutrition class at 1:00 on Thursday and my appointment is immediately after. I'm making Matt tag along because I'm already feeling a little overwhelmed. 9. What would this person eat every day if he could? See #8 (he loves sandwiches) and salad! 11. What would he never wear? hmmm...hard question. I know what he'd better never wear...anything with a Steelers logo on it! 15. What is something you do that he wishes you wouldn't do? He thinks I'm perfect...hahaha. yeah right! There are probably lots of things I do that he wishes I wouldn't do...right now, constantly talking about how huge I am and rolling over on my back in the middle of the night. 16. What is his heritage? wow! this one I really have no clue about...but I'm not sure that he knows either. I'll have to ask him. 20. What is one unique talent he has? he's an excellent car washer, grass cutter, and grilled cheese maker...and he makes the best burgers in the WORLD! We went Monday for an appointment at the hypertension clinic. My blood pressure had increased some - 135/82. The doctor decided to double my current dosage of medication. I was kind of bummed about it, mainly because I don't want it to become a bigger issue as the pregnancy progresses. After we finished at the hypertension clinic, we went over to the lab at the hospital for my one hour glucose tolerance test. I was a little more nervous than I had been throughout my previous preconception and pregnancy tests. I started to get a little dizzy before we went into the lab, and I was afraid I'd have one of my passing out "episodes". Matt pulled up some pictures on his phone and we talked about each one of them until my anxiety had passed...I'm happy that he keeps me so calm. I had to call one of the nurses today about my test results. She said that my glucose levels were "elevated" and that Dr. Dawley was concerned about gestational diabetes. She said she was mailing me an order for a three hour glucose tolerance test, so it looks like we'll be spending 3 hours on Saturday in the lab. We have another appointment with the doctor on Monday, so I'm sure we'll get the results then. I cried a little after talking to the nurse. It all just kind of worries me. And I guess I kind of had my hopes up because things had been going so smoothly with the pregnancy. I just want us to have a happy, healthy baby girl. Aunt Patty reassured me that it would be okay because the Lord takes care of sweet peas and babies. (Aunt Patty and Uncle Charles have called me "sweet pea" for as long as I can remember). The good news is that Madison's furniture is assembled and her room is painted. I adore it! It's so bright and just being in there makes me happy! 26 weeks - Why do I look like I'm shrinking as I get bigger?? Matt felt Madison kicking for the first time last night. I think I was just as excited as he was. We'd been trying to accomplish this for about a week now with no luck. It seemed like every time he'd touch my belly, she'd quit kicking. But last night she finally decided it was time to let daddy in on the fun. The way his whole face lit up when he proclaimed "I felt her!" was just so cute. It was an exciting moment! My mom said that maybe she was just excited about the Super Bowl...this better not mean she's going to be a Steelers fan! We had an appointment today with the doctor. Everything is still going great. The doctor said the baby and I both seem to be right on track...just have to have another 24 hour urinalysis and glusoce tolerance test before the next appointment. We'll see the doctor every 2 weeks now.